Keep your home cool this summer by installing an efficient Bryant Evolution Series or Preferred Series air conditioning unit. Not only will they keep your home cool in the summer heat, these units also filter and clean the air within your home making it safer for you and your family. Bryant has been improving indoor comfort with their air conditioning units for over one hundred years. Their solid Evolution® System is their most efficient home cooling system and has earned them the Consumer’s Digest “Best Buy” status. The more efficient your cooling unit is the more money it can save you in the long run, especially if you like to keep it running during our increasingly long and hot summers here in North Vancouver. On the flip side the Preferred™ Series and Legacy™ Line products give you great performance and comfort while saving you money on both operational and installation costs. 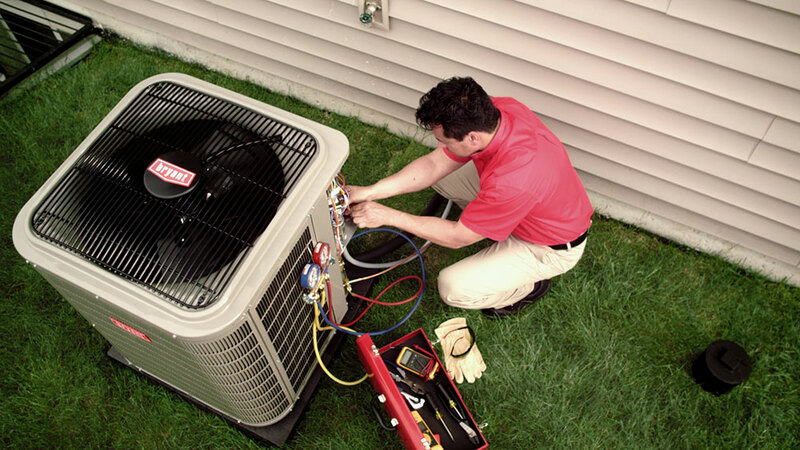 We also service and repair your existing air conditioning units in North Vancouver, both in residences and businesses. Our friendly and capable technicians are fully certified and trained to work on all of the different types of air conditioning systems that we come across in North Vancouver. Contact us today to book a free estimate with one of our qualified technicians. Ductless air conditioning systems are commonly referred to as ‘mini split’ systems. These systems are composed of two main sections – an indoor section that releases cooled air into the desired room or area of the house, and an outdoor section that releases warm air outside. One of the benefits of ductless systems is that there is no more bulky ductwork needed since there is a compact refrigerant line that runs between the indoor and outdoor sections. Ductless systems are an ideal solution for indoor spaces that don’t have existing ductwork, as well as for additions to homes, or in certain areas that get to be too warm. Ductless systems come in a wide variety of options; you can choose the right size and style to fit your home and budget. Another great feature is that many of these systems are able to heat and cool multiple rooms using a single outdoor unit. They are fast to install – There is no costly ductwork and ductless systems can be used in most places where ducted systems can’t reach. Peace and quiet – The indoor sections run at just 26 dB so it won’t disturb you or your family. You’re in control – It’s very easy to maintain exactly the temperature you like in each room. No more eyesores – You can choose from a selection of styles and sizes that won’t detract from the aesthetics of your home.